Netflix is a subscription service which makes money with a simple subscription-based packaging and three subscriptions levels (basic, standard and premium) from which you can get the streaming of all the available series, movies and shows available on the Netflix library. Netflix is changing the way we consume traditional media. From series like Stranger Things, Narcos and Black Mirror Netflix have been able to become a titan of the media industry, with more than a hundred and fifty thousand members across the globe. With three simple subscription plans (basic, standard and premium) from $8 to $14, Netflix has been able to become a multi-billion dollar unicorn with more than a hundred fifty billion at the time of this writing. In this article, I’ll break-down how its business model works by looking at its financial statements. The purpose is to dissect the Netflix business model by looking at hard numbers. In no way, this is a recommendation on Netflix stock, neither investment advice. We’ll use numbers to understand the logic behind the Netflix business model. What can we learn from Netflix business model? The genesis of Netflix came in 1997 when I got this late fee, about $40, for Apollo 13. I remember the fee because I was embarrassed about it. That was back in the VHS days, and it got me thinking that there’s a big market out there. So I started to investigate the idea of how to create a movie-rental business by mail. I didn’t know about DVDs, and then a friend of mine told me they were coming. I ran out to Tower Records in Santa Cruz, Calif., and mailed CDs to myself, just a disc in an envelope. It was a long 24 hours until the mail arrived back at my house, and I ripped them open and they were all in great shape. That was the big excitement point. This was the year 1997, still a long way to go until Netflix reached its scale and international expansion worldwide, which can be dated at 2017. Our business model is subscription based as opposed to a model generating revenues at a specific title level. Therefore, content assets, both licensed and produced, are reviewed in aggregate at the operating segment level when an event or change in circumstances indicates a change in the expected usefulness. With a simple packaging and three subscriptions (basic, standard and premium) you can get the streaming of all the available series, movies and shows available on the Netflix library. The business segments are the are of the business that has a different financial logic and thus requires a separated strategy. As of 2017 Netflix revenues were over $11 billion, with a staggering growth compared to just 2013, when the revenues passed $4 billion. If we look at the global picture, you can see how Netflix has more than 117K subscribers worldwide. Domestic streaming: revenues from monthly membership fees for services consisting solely of streaming content to our members in the United States. Let’s dive a bit into the numbers of each of those segments to understand the financial logic behind those and also see what’s the strategy of Netflix in the next future. From the numbers above you can see how the Netflix total numbers of members in the US grew from 44,738 in 2015 to 54,750. This growth also meant an increase in costs. One interesting aspect to look at is the contribution margin. In short, this is given by the revenues minus all the variable costs (the costs that vary according to the production output). This concept is essential to assess the financial success of specific products. In this case, you can see how the contribution margin is 37% in 2017. Taken in isolation, this number is relatively significant. Instead, if we compare it to the other segments of the business, we can have an overview of which is more successfully (at least in the short term) financially. The international segment has become almost as big as the international segment as of 2017. In fact, with over $5 billion in revenues, this has been growing at a faster and faster pace also thanks to the international expansion plan that Netflix started in 2015. The increase in international cost of revenues was primarily due to a $998.5 million increase in content expenses relating to our existing and new streaming content, including more exclusive and original programming. Other costs increased $132.5 million primarily due to increases in our streaming delivery expenses, costs associated with our customer service call centers and payment processing fees, all driven by our growing member base, partially offset by decreases resulting from exchange rate fluctuations. In fact, if we look at the contribution margin, we can see how in 2017 it was a positive 4%, while it was negative in 2016. As of now, this is a normal process. In fact, where Netflix has already consolidated its presence in the US, with the international expansion the company is investing resources to gain traction in new countries. International competition isn’t as easy as you might think. In fact, if we take into account the fact that Netflix is a media company, entering a new market isn’t only a matter of distribution but also of understanding cultural differences in their programming. What about the oldest part of the business? The DVD segment. Today we give for granted the on-demand business model of Netflix. Yet, back in the days, you could have movies “on-demand” only with the pay per rental business model. As technology has evolved, the on-demand model has been possible also for media companies. The interesting aspect from the financials is that the DVD segment has a very high contribution margin. In fact, of the three parts (domestic, international and DVD) it seems the most profitable. True, it is just a small fraction of the overall revenues. Yet as of today it is a profitable segment. What kind of expenses does Netflix incur for this segment? Cost of revenues in the Domestic DVD segment consist primarily of delivery expenses such as packaging and postage costs, content expenses, and other expenses associated with our DVD processing and customer service centers. The number of memberships to our DVD-by-mail offering is declining, and we anticipate that this decline will continue. Ok, not an exciting business. Yet this is where it all started. For a company that started in 1997 as a website with 925 titles available for rent through a traditional pay-per-rental model; a company that in 2000 offered itself for acquisition to Blockbuster for $50 million and now it’s worth more than a hundred fifty billion dollars. What can we learn from it? There is a misconception in the business world, where a business model is seen as a monetization strategy. A business model also embraces a monetization strategy but is way more than that. It is how you monetize your business. It is about how you make your product or service available to an audience. It is about the value you create not only for your business but also for several stakeholders. In fact, as I see it, the more a business model creates values for several players, the more it will be able to create an ecosystem that will help the organization part of its scale. In the end, the organization and the scale is just the result of that ecosystem. This also applies to Netflix. Looking at the financials is a good starting point. Yet Netflix isn’t only a subscription-based media provider. Netflix it is also based on the concept of on-demand. It is a media production company. It is a brand that in the mind of its subscribers can mean several things. In fact, among the over a hundred thousand subscribers some tribes get assembled around the Netflix series which have become the symbol of our generation. The first critical aspect of business models is that that we like so much the word “innovative” what we tend to call anything we see as such. In reality, in most cases, it is just about taking an old business model and apply it to a new industry. Just like the wheel, invented in Mesopotamia over five thousand years ago, it took us way more than a thousand years to put it on the bottom of luggage. In fact, the first wheeled luggage might date back to the 1970s. In other words, in business just like in any different life domain, what’s hard isn’t the discovery of a new business model but the application of a business model that has always existed to new industries. The subscription business model has been used by traditional newspaper, magazines and academic journals for decades. One interesting aspect that you’ll notice if you go on the Netflix blog is that the most critical editorial piece is the Netflix ISP Speed Index, a monthly report that provides updates on which Internet Service Providers (ISPs) offers the best primetime Netflix streaming experience. Companies like Netflix, or other tech giants like Google, Amazon, Facebook, and Microsoft successes are strictly tied to the technological advancements we’ve achieved as humanity. Imagine you had a poor internet connection. Would you pay even a dollar for Netflix subscription? Of course, you wouldn’t. Thus, as technology evolves, business models of companies like Netflix depend on how fast technology has advanced. Had the internet not snowballed Netflix would still be a DVD rental company. Why? The on-demand business model is possible thanks to the speed at which the internet infrastructure can travel today. In the digital world, the on-demand economy is dominating the business arena. The “Uberization” of services means offering more option on how to consume something. In Netflix case, the subscriber is given with more flexibility, optionality about what to watch. For years, TV has used us to rigid schedules. That worked in the years where large corporations with strict schedules were the norm. Instead, with the rise of the digital nomadism and the self-employed, freelancer our habits and the way we consume media has changed drastically. In this scenario, on-demand has become a dominant business model in the media industry. Also in this case though what it seems an innovative business model it’s not. In fact, once again what is innovative in its application. In fact, when Netflix back in 1997 started to rent DVD from its website, it was already working on the premises of the on-demand business model. However, as the web evolved and streaming became viable, they started to apply the on-demand model through their platform. 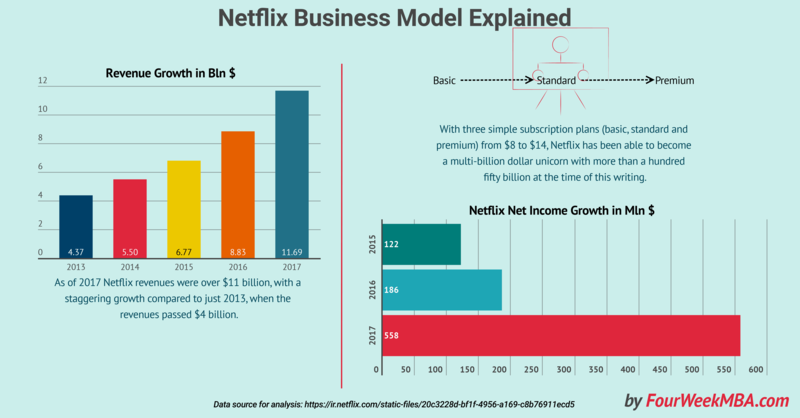 What makes a business model powerful is the mixture of several ingredients; in the Netflix case, the on-demand business model, with a simple subscription applied to the traditional media industry has made it incredibly effective. Netflix proved that the subscription business model could scale. However, this doesn’t happen overnight. If we look at the international expansion of Netflix, we can see how it started to expand outside the US only in 2010. And it was only in 2016 that it launched globally. This isn’t random. The subscription business model requires a lot of financial resources. We acquire, license and produce content, including original programing, in order to offer our members unlimited viewing of TV shows and films. Streaming content obligations increased $3.2 billion from $14.5 billion as of December 31, 2016 to $17.7 billion as of December 31, 2017 primarily due to multi-year commitments associated with the continued expansion of our exclusive and original programming. Streaming content obligations include amounts related to the acquisition, licensing and production of streaming content. An obligation for the production of content includes non-cancelable commitments under creative talent and employment agreements. An obligation for the acquisition and licensing of content is incurred at the time we enter into an agreement to obtain future titles. Once a title becomes available, a content liability is recorded on the Consolidated Balance Sheets. Certain agreements include the obligation to license rights for unknown future titles, the ultimate quantity and/or fees for which are not yet determinable as of the reporting date. Traditional film output deals, or certain TV series license agreements where the number of seasons to be aired is unknown, are examples of these types of agreements. The contractual obligations table above does not include any estimated obligation for the unknown future titles, payment for which could range from less than one year to more than five years. We all like the logic and the scalability fo the subscription business model. You create a product or service have people enroll in it, and you make money each month, steadily. Yet this isn’t the case. When you offer a subscription that will never come at a low price. Instead, you will need continuous support, development, new ideas and ways to make sure your subscribers stick as long as possible. In fact, only when you’re able to have a customer acquisition cost (CAC) that is way lower than your customer lifetime value (CLV) that is when your business gets viable. However, this is easy said than done. In fact, a sales funnel of a subscription-based model is way longer than a company that sells a one-off product or service. This is reflected in Netflix financial statement as on many other companies that operate with the logic of the subscription-based business model. Netflix has grown from a DVD rental site born in 1997 to an over a hundred fifty billion market cap company. Today Netflix has become a major player in the media industry, and it is investing billions of dollars in production and development of TV Shows that have become a symbol for millions of people worldwide. At the same time, the international expansion is costing Netflix billion of dollars, and the subscription-based business model requires continuous investments to keep millions of people pay their monthly plan. As the SaaS industry has taken over the tech world, many give for granted that a subscription business model always makes sense. In reality, as we’ve seen in the Netflix case study, it took it thirteen years to start expanding outside the US. And only in 2016, after almost twenty years Netflix was able to reach Asia.